Single page autograph document signed, 7.5" x 6.75" on laid paper. Light toning and spotting with trivial edgewear. Expected folds. Tiny .25" separation at one fold. Verso with two small pieces of tape along top edge, perhaps was used for mounting. Near fine condition. 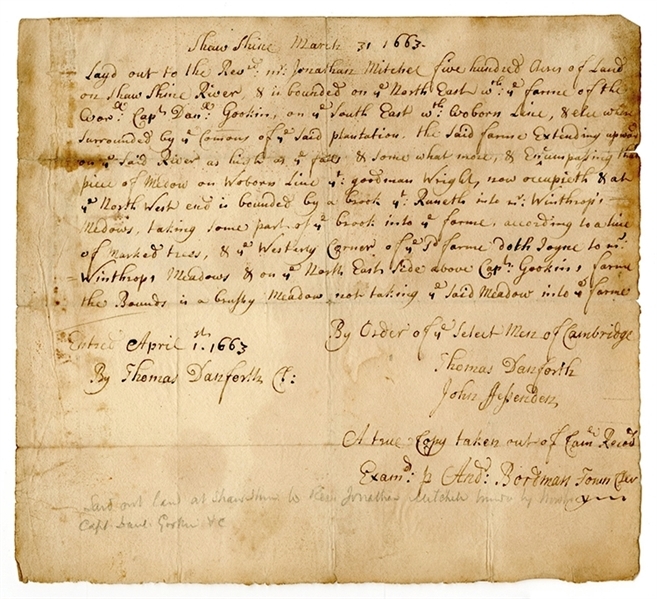 A wonderful very early land deed of a large parcel of land representing 500 Acres North of Cambridge, following and bound by the Shaw Shine River. As with such early land deeds the properties are identified by the local meadows, trees, significant topographical markers and by resident names whose properties were boundaries for the land (such as " bounded on ye North East w. ye farm of ye Capt Daniel Gookin, on the South East ", and "extending upward on the Said River as High as the falls & some what more, & encompassing that piece of medow on Woborn line"). The location of the parcel appears to the North of Cambridge as it borders Woburn and the Shaw Shine river (which today is known as the Shawsheen River), a 27 mile tributary of the Merrimack River in northeast Massachusetts. The 500 Acres of land is deeded to a prominent Cambridge church minister, Jonathan Mitchel, who was minister of the Cambridge Church from 1656–67, and used the extension and liberalization of baptism in the 1650s and 60s–later denigrated as the halfway covenant–to bring the unchurched and their children into fellowship, thus indicating a strategy of reaching out to the community. (This period was pre- Cotton Mather)At the age of 19, he entered Harvard College.In 1650, he was chosen a tutor and Fellow of Harvard College. His connection with the church at Cambridge continued eighteen years during which time he wrote on the Book of Genesis and part of Exodus and on the Book of John. The land deed also references the property boundaries of several significant early settlers of the time, including Daniel Gookin and Thomas Danforth. Daniel Gookin was born in Kent England held a distinguished career as a soldier, historian and protector of the Indians. He became captain of the militia in Cambridge and was elected to the Massachusetts House of Deputies ultimately being appointed Superintendent of all lndians under civil authority in 1656. He was one of the licensers of the Cambridge Printing Press in 1662, wrote in 1674 Historical Collections of the Indians of Massachusetts (published by the Massachusetts Historical Society, 1792), and also a never-published and long since lost History of New England. The prospectus of this second book, issued with his first, is so good as to make us regret greatly the loss of his manuscript, which was probably destroyed by fire. A third work of Gookin’s, An Historical Account of the Doings and Sufferings of the Christian Indians in New England, finished in 1677, just after King Philip’s War, was also lost for many years, but was finally found in England and sent back to America. Thomas Danforth was a politician, magistrate, and landowner in the Massachusetts Bay Colony. A conservative Puritan, he served for many years as one of the colony's councilors and magistrates, generally leading opposition to attempts by the English kings to assert control over the colony. He accumulated land in the central part of the colony that eventually became a portion of Framingham, Massachusetts. He was appointed Treasurer of Harvard College in its charter of 1650, and served as a steward of the college from 1669 to 1682.